The solid red line is the standard 30-year normal of Julian Day 117 (April 27). Earliest "last freeze", March 27, 1925 (Julian Day 86). Latest "last freeze", May 29, 1947 (Julian Day 149). Year 2006 "last freeze", April 9, 2006: Day 99. 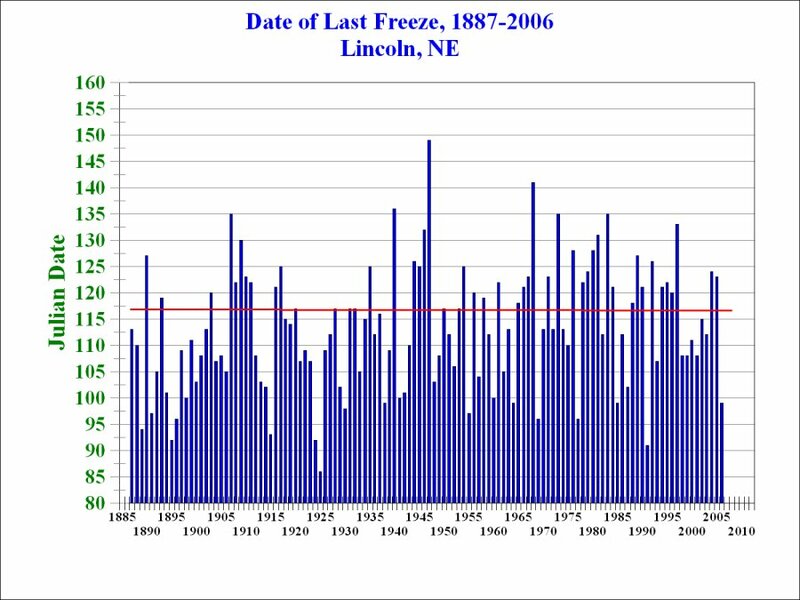 117-year, 1887-2005, average "last freeze", April 23 (Julian Day 113). 30-year, 1971-2000, average "last freeze", April 28 (Julian Day 117). NOTE: Julian Dates are a representation of the calendar. "the day of the year in a number format".